There’s no end to the high drama triggered by the surreptitious letter from Karnataka Governor Vajubhai Vala, on Wednesday (May 16) night, to BS Yeddyurappa inviting the BJP leader to form the next government in the state that threw up a hung verdict on May 15. Although the unprecedented 3-hour-long hearing in the wee hours of Thursday (May 17), by a Supreme Court bench of Justices AK Sikri, SA Bobde and Ashok Bhushan, paved the way for Yeddyurappa to be sworn-in as chief minister (Yeddyurappa took oath of office at 9 am – just four hours after the SC order), the manner in which Governor Vala acted has riled former BJP leader and senior advocate Ram Jethmalani enough to come out of his self-imposed retirement from the legal profession. 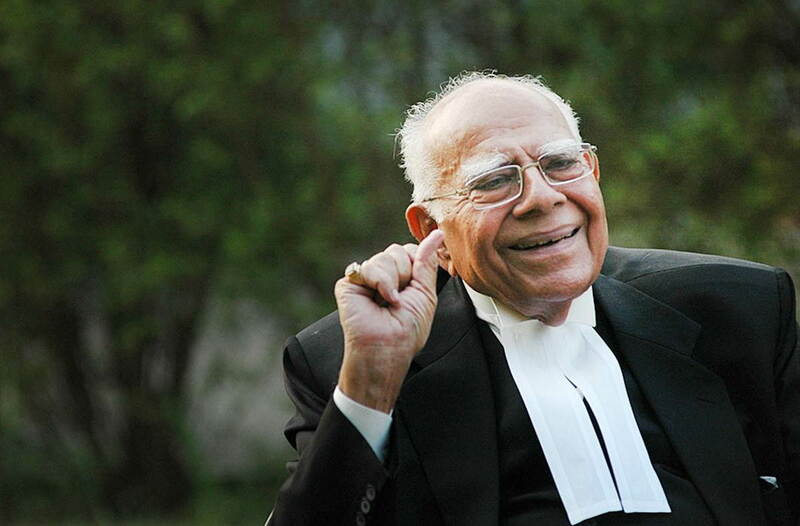 The 94-year-old Jethmalani, widely acknowledged as among the most brilliant legal minds in the country and arguably the most senior advocate today, has now approached Chief Justice Dipak Misra seeking permission to appear the legal battle over Karnataka poll drama. The eminent lawyer has sought the Chief Justice’s permission to allow him to intervene in his “personal capacity” to challenge the Governor’s decision of inviting Yeddyurappa to form the government. It may be recalled that in the Karnataka assembly election results, announced on May 15, none of the three political players (BJP, Congress and the Janata Dal-Secular) in the 224-member Vidhan Soudha got a clear majority. While the BJP emerged as the single largest party with 104 seats, the Congress and JD (S) bagged 78 and 37 seats respectively. The BSP, which had contested the Karnataka polls in alliance with the JD (S) won a lone seat. Soon after the counting trends showed that the state was heading towards a hung assembly, the Congress had decided to extend its support to a JD (S)- led government headed by the regional outfit’s leader, HD Kumaraswamy. In the Karnataka assembly, the magic figure needed for political parties or their alliances to secure a simple majority is 113 seats; the Congress-JD (S) and BSP combine had 117 (including support from the lone legislator from the Karnataka Pragnyavantha Janatha Party). In contrast, the BJP had 105 seats (including support from one independent legislator). The Congress and JD (S) have argued that since their combined strength is above the majority mark and as they had first approached Vala to stake claim to form the new government, Vala acted unconstitutionally and in violation of legal precedents to invite Yeddyurappa to take oath as the next chief minister, granting him 15 days to prove his BJP regime’s majority on the floor of the Karnataka Vidhan Soudha. Ram Jethmalani, whose bitter parting with the BJP is well-known, has submitted before the Chief Justice that Governor Vala’s action was a “gross abuse of power” and that he had “disgraced the office of the governor”. It remains to be seen whether Jethmalani, who had announced his retirement from the legal profession last year, would be permitted to appear before the bench of Justices Sikri, Bobde and Bhushan on Friday (May 18) when it resumes hearing the petition filed by the Congress challenging Governor Vala’s decision. Speaking to reporters, Jethmalani, however, made it clear that he saw gross illegality in the BJP’s claim to form a government in Karnataka as well as in the manner in which the Governor refused to invite the Congress-JD (S) combine but granted the chance to Yeddyurappa. “’What has the BJP said to the Governor that he did such a stupid action (sic)? The order of the Governor is an open invitation to for corruption,” Jethmalani said.